Tiger Shark is a fascinating beast for its beautiful strips with powerful and agile nature. Are you love to see that combination in your recurve bow? Then you nock in the right place. In the ‘Southwest Archery Tigershark - 62" Takedown Recurve Bow and Arrow Set’ you will find the reflection of creativity, swiftness, and quality. When we say quality, Southwest Archery Tiger Shark design and developed by same Samick Sage Company. Hope you remember that in our earlier review about Sage, we ranked that as the best recurve bow in its class. SAS Tiger Shark is an improved version of Samick Sage takedown. If you go through our details the features and benefits of tiger shark recurve bow reviews, you will surely understand why we call it an advanced version of Sage. Hope you will stay with us up to the end. The manufacturer Southwest Archery Supplies put his best effort to make this bow is a piece of art. They use four types of best quality wood like Dymond wood, Tigerwood, White Oak, and Padouk to construct the riser to make it durable and long lasting. Veteran archers should notice the resemblance of the design between the TigerShark and the Samick Sage. In the handle part of the riser, they are not using any extra materials. In spite of this, the ergonomic design makes gripping smooth and comfortable both for right handed and left handed archers.The thermostatic characteristics of wood form the grip comfy in winter too, as you will not feel any cold shock like metal riser. The arrow shelf of the riser cut approx. 1/8-inch past center for whose prefers to shoot from the arrow shelf. You can also use a mechanical arrow rest (flipper style rest with a plunger) if you do not like to pull from the arrow shelf. Southwest Archery can accommodate both the options for archers. Finally, the subtle red line above the arrow rest, rounded edges and handcrafted design give it an overall polish feel. Similar to Samick Sage and Spyder bows, Tiger Shark also made of two-layer laminated hard maple, rounded with matte black fiberglass. They featured with improved limb pockets, reinforced limb tips, and upgraded flush limb bolts. It is also compatible with Fast Flight or Flemish sting. Notably, the Flemish made by SAS in the USA. The limbs of Tiger Shark recurve bows are completely takedown and 100% interchangeable with Samick or Spyder limbs of all weights. So, one bow will stay with you a long time from your childhood to adult age. Tiger Shark is a great takedown bow suitable for all gender and ages of folks. Not only this, with this fantastic bow you can do anything in archery like hunting big games, target practice, bow fishing or archery competition. The lightweight, and tends to zero hand shock during shooting helps you to shoot accurately towards the target. It is a quiet bow, adding silencer makes it more peaceful for hunting with a 45+ poundage one. 62 inches long Tiger Shark takedown recurve bow come up with a wide range of poundage from 25# to 60# which makes it is an excellent choice among beginner and expert archer of all ages. It is also comfortable to both right and left-handed people. The takedown nature makes it easy to disassemble during transport and reassembled after reach the destination like hunting woods or target shooting indoor or outdoor field. It will also allow you to set your draw length and weight according to your capability. The riser of the Southwest Archery Tiger Shark bows equipped with threaded inserts to allow all kinds of accessories required for bow hunting or recreational shooting or bow fishing whatever you like. 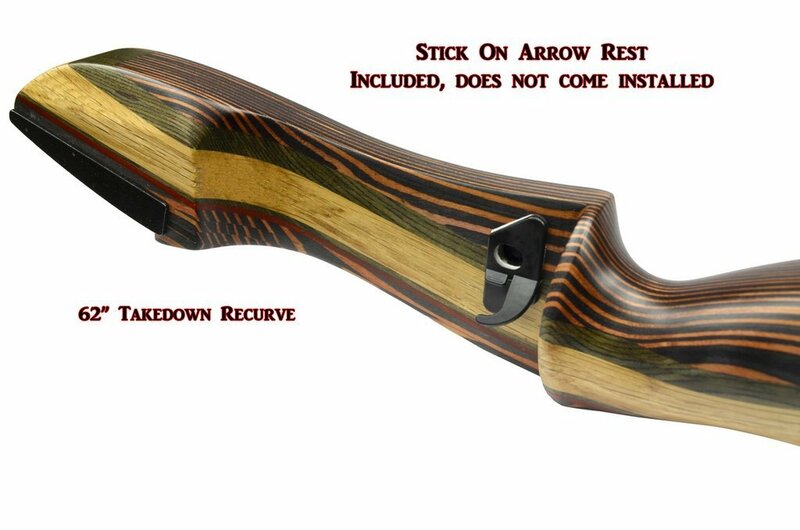 You can set arrow rest, shelf pads, sights or quiver, fishing reels or stabilizer and so on. Nonetheless, the package includes one handcrafted riser (LH or RH), one pair of matching limbs (upper and lower), one 14 strand Dacron string, one stick on adhesive arrow rest or one arrow shelf rug rest (depending on model), and detailed step by step instructions with photos. Q1: Does Southwest archery supplies includes stringer tool with its package? Ans: Yes! They include a stringer tool with it. However, for 25# and 35# category with or without stringer tool is available. So, check it before making a purchase. Q2: Is there any difference between Spyder and Tiger Shark? Ans: There is no fundamental difference between the limbs of Spyder or Tiger Shark. However, the riser made of different woods. Q3: Is it offer precision pin-looking technology? Ans: There are two packages: standard and pro. The precision pin-looking technology for exact limb placement is available in Tiger Shark Pro models only. Required an Allen wrench to tighten and open the bolts of the limbs. Solution: The southwest archery includes an Allen wrench with its package to reducing the hassle of sourcing that separately. Tighten the bolts with a wrench will give you proper balance of force applied by you on limbs which increase the life of bow. To get something better you have to face some hassle of carrying an Allen wrench with you for adjusting it. To make the bow perfectly quiet need to add a silencer. Solution: Though the Tiger Shark is quiet enough, for accurate shooting add a silencer will give you a better result. As it is not a big deal, you can easily add silence in your string. Solution: Dacron string is good enough for target shooting by a beginner. 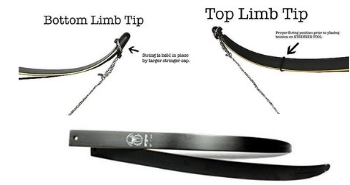 However, the limb tips come with reinforced and compatible with the improved string. So, you can certainly change the existing string with fast flight or Flemish. Though Tiger Shark is an exact copy of sage, there is some similarities and differences between this two takedown bows. Both the bows are a takedown, but Sage comes up with a tapered knob which is easy to assemble the limbs without the help of an Allen wrench. Both the bows support right and left-handed archer. Both have a wide range of draw weight and interchangeable arms with each other. Brace height is 7 5/8’’ to 8 ½’’ for Tiger Shark, whereas the brace height of Sage is 7 ¼’’ to 8 ¼’’. In price and quality both are close, but based on customers review Sage is little ahead. 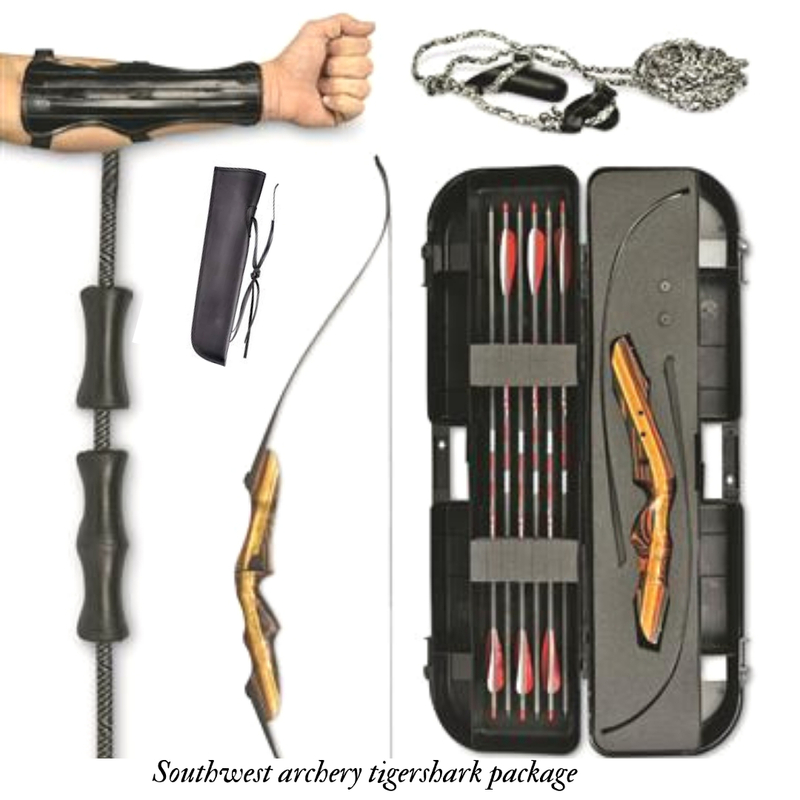 Southwest archery supplies is a renowned company involved in traditional bow making for a long time. Likewise, “Southwest Archery Tigershark - 62" Takedown Recurve Bow and Arrow Set” is the best recurve bow manufactured by them. They directly use the technical know-how of Samick designer to accomplish this super quality recurve bow. Tiger shark also possesses all necessary features related to traditional archery. So, you can keep trust on it, for sure you will never find such a good quality bow with this price range.